Light up your shuffleboard with our NEW table lights. 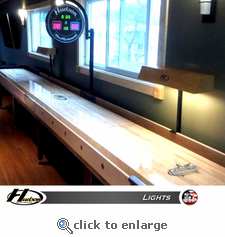 These lights are sold in pairs and mount to the side of your Hudson shuffleboard. Each light is individually powered and comes standard in a natural finish. Custom stain options can be ordered to match your table. Lead time is 2-3 days for natural finish. Custom stained lights have a lead time of 7-10 days.